Is there a better alternative to HourWorld Live Deskpicture X? Is HourWorld Live Deskpicture X really the best app in Wallpaper category? Will HourWorld Live Deskpicture X work good on macOS 10.13.4? 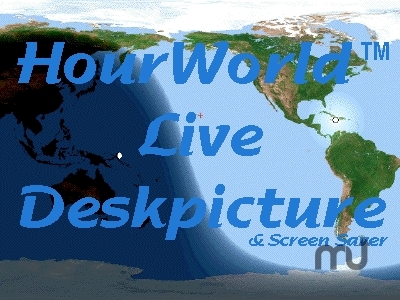 HourWorld Live Deskpicture X is a dynamic image of the earth for your desktop. Stop using that static, unchanging picture on your desktop, and put on a dynamic image of the earth that updates as the world turns! High resolution maps and beautiful, specially-generated graphics are individually crafted for 14 different monitor sizes from VGA (640x480) all the way up to the 23"Apple Cinema HD Display at 1920x1200 pixels or a 20"Apple Cinema Display at 1680x1050 pixels. Increased the number of annual time zone map transitions from 2 per year to 21, to be less USA-centric and more closely reflect reality as DST begins and ends in various countries around the world. Pre-loaded the program with time zone maps through Dec 31, 2008. HourWorld Live Deskpicture X needs a rating. Be the first to rate this app and get the discussion started! Added support for 1280x800 and 1440x960 monitor sizes. Tested for compatibility under Rosetta emulation mode on Intel Mac. No issues found. Launch and response times were found to be slightly faster on a 2.17 MHz Intel Core Duo-based MacBook Pro than on a PowerPC-based 1.67 MHz G4 PowerBook. Extended the operation time for unregistered copies to two hours.